Tired of slow and tedious downloading of videos, movies, music or games on your Samsung Galaxy S7 or Galaxy S7 Edge? Are you looking for the better way to download your files fast? 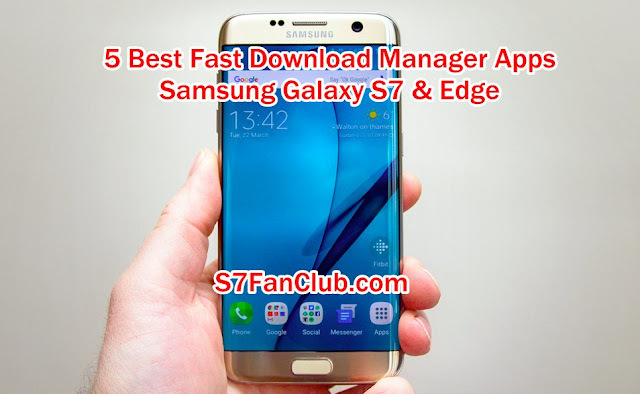 Then, I am going to cover the Best 5 Galaxy S7 Download Manager that can ease the process of downloading the files on your phone. There are the numerous apps on the play store that can help and accelerate the downloading process. Here is the best topping the list is the UC Browser that not only provides you with the best browser but also, it can serve as the best download manager. With the UC browser, you can download files in a matter of seconds. The app offers the features like fast and stable downloading, video for all tastes, control videos with gestures and also, the night mode. Now downloading becomes a piece of cake with the help of Loader Droid download manager. The app is developed for Android, as the name implies, so it works great on the Galaxy S7. The app supports all the kinds of the downloading including apps, images, videos, etc. the app offers the number of features including the safe and efficient downloading with the additional features of recognizing links in the browsers automatically and scheduling the downloads. Next on the list is another one of the most powerful download manager app available on Google Play Store. The app lets you to download files in different parts that make the downloading process smooth and efficient. Additionally, the ADM has the built in browser that can help you to get the links of the files to be downloaded. ADM also has the ability to backup downloaded files on SD Card, offers widget to home screen and sounds and vibration on the completion. Here comes another amazing Download manager app for S7. Turbo is yet another amazing and fast app that accelerates your downloading process whether it is video or image. The app utilizes multiple HTTP connections that can maximize the speed of downloading. Along with this, the app offers unlimited file size support, background process, download history and sound notifications on completion. Next on the list is Fast Download Manager which allows you to download files faster and in significantly more convenient way. The app offers the built- in browser that allows you the web surfing along with the many other features. The features like full control on downloading files, no restrictions and large files supported.